I love great design, especially when it solves a problem in an elegant way. It's even better when the new solution doesn't have any side effects. It's no secret that I really like my Copco coffee cups. Every morning, an overwhelming majority of adults in the U.S. drink coffee or tea. Since most of us drink it on-the-go, we can't use a traditional ceramic mug while driving to work. The key to drinking coffee on-the-go is to have a well designed lid. And there's no shortage of people who've taken notice of different lid designs. Before 1990, coffeehouses and cafes weren't common in the U.S., so a lot of the coffee consumed before then wasn't grab-and-go like it is today. Over the past twenty years, the to-go coffee cup has evolved. Originally, the to-go coffee cup included a simple lid that had to be removed in order to drink the coffee. Then a perforated tab was added to the lid so that you could open up a drink hole. The problem with the tab was that, once it was opened, it couldn't be resealed since the perforation was broken. Like most any other problem, over time, a better solution was engineered. 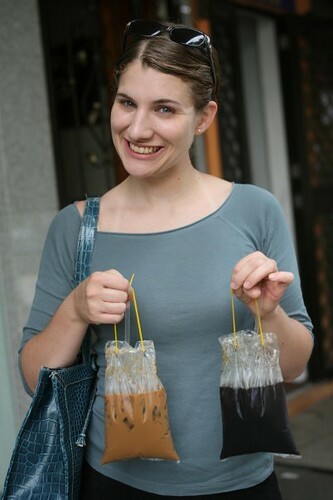 About 15 years ago, I made a couple trips to Singapore where I discovered the innovative way that the locals carried their coffee: in a bag. Initially, I couldn't figure out what these bags were until I saw my driver buy a "cup" (bag) of coffee and hang it on the radio knob in his car. Pure genius. As he turned corners, nothing spilled and he could simply lift it up by its string and drink it through a straw sticking out of the side of the bag. In the mid-1990s, I lived in an apartment that was formerly the Hotel San Clemente. It had (and still has) a cafe in the lobby that opens up into a courtyard. Needless to say, I drank a lot of coffee at this, my favorite, cafe. Nearly every day, I'd stop by, on my way out, and get a cup of their chocolate almond raspberry coffee. In 1994, the lobby cafe provided simple coffee cup lids with the perforated tab which would leak as the coffee splashed around in the cup. To solve this problem, I'd always use two lids with the tabs opposite each other. While this nearly solved the problem, it wasn't possible to drink the coffee until I got to work. 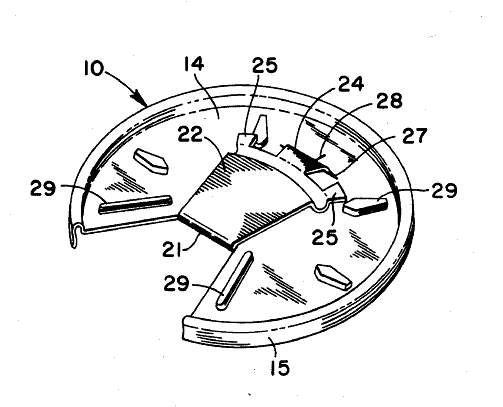 About a year or two later, the owner began providing coffee cup lids that were designed like the ones now used at Starbucks. Since the hole in these lids is raised, it prevents most of the coffee from splashing out unless you just happen to rattle the cup the wrong way. Best of all, you can drink and drive without any spillage. 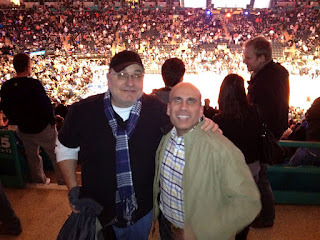 When my wife and I lived in Kenya, we coined the term, "Kenyan full," which means filled to the very top. For some reason, bottles of water, cups of coffee, etc, in Kenya, were filled to the tippy top. I'm guessing that it's the equivalent of a baker's dozen. The problem with a cup of coffee that's filled to the brim, even with today's "Starbucks" lid design, is there's very little chance that your coffee won't spill out – it's just too full. But, the Kenyan's had a simple solution to this problem: masking tape. After they snapped the lid on your cup of coffee, they'd stick a half inch piece of narrow masking tape over the drinking hole to keep it from leaking. Hopefully, the masking tape glue wasn't unhealthy - but, regardless, you couldn't easily drink your coffee and then reapply the masking tape while you drove. In 2004, I noticed that Dunkin' Donuts had a 100% solution to this problem which matched my personal requirements for what a coffee cup lid should be. 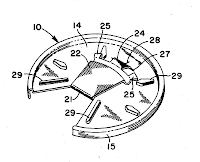 Simply put, Dunkin' Donuts provided a lid, similar to the Starbuck design, which had a flap that plugged the drinking hole in order to keep the coffee from splashing out. When you want to take a sip, you'd simply flip the flap up and it would snap into place on the opposite of the cup. After taking a sip, you could replug the drinking hole. A perfect solution without any side effects. Today, I was at Bed, Bath, and Beyond (where I bought my first Copco cup in 2009) and I noticed that they were selling Copco cups with newly designed lids. It attempts to mimic the Dunkin' Donuts lid, but it has two small side effects that I don't care for. First is the fact that they've raised the lip of the cup in such a way that you can't form a complete seal, with your lips, around the drinking hole. This just doesn't feel natural when drinking and it presents a risk where coffee can leak out while drinking. Second is the fact that the rubber plug is too close to the center of the cup when it's in the open position and it interferes with your nose. This means, since the rubber plug will be wet with coffee, that the tip of your nose ends up getting coffee on it. However, I have to say that I'm impressed with the seal that the plug forms. 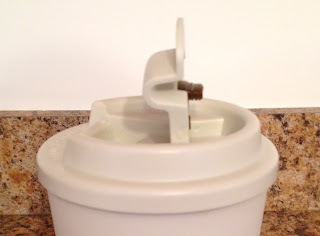 Not only does it seal the drinking hole, but it also plugs the air hole in such a way that, when fully secured, you could throw the cup, full of coffee, up in the air, while spinning it, and not a drop will leak out. I'll give my new cup a try this week. I think I'm going to really like the fact that it won't splash on me as I get into and out of my car – a problem that ends up spilling coffee on my hand about once every week or two as I juggle my keys, lunch, and iPad while getting into and out of my car. I learned a new term, yesterday: Big Data. Think of it in terms of Big Oil, Big Tobacco, Big Media, Big Government, etc. Big Data represents companies with huge amounts of data that know or can forecast things which we hadn't realized before. Google and Facebook know people's habits, history, and interests across the Web. Bit.ly announced a service, last year, where they can predict which stories will get the most attention over the next 24 hours and act on it. There is no shortage of examples of how this data is being used. While Americans are sensitive to privacy concerns, it doesn't compare to most of the EU. And the EU's concerns are valid given their history over the past century. Social networks, created by analyzing telephone billing statements during WW II, were one way that Germans could connect, say, political figures with individual citizens of the cities they invaded. It's one thing for an individual to control who they connect with publicly or on the Web; but it's another thing when it's happening without your knowledge. lack of privacy grows old, fast. Instead of trying to solve every possible problem when developing new technology, start with the simplest solution for the most important use case. Apple is king at accomplishing this through design and UX. Instead of trying to boil the ocean, Apple focuses on the clean and simple solution that will account for the vast majority of use cases. Two of the biggest dot com success stories of 1990s were Amazon and eBay. Amazon started off selling only books - instead of everything under the sun. Why books? Because, other than a few specialized products such as jewelry, books are some of the most valuable items/volume that consumers purchase regularly. When eBay launched their website, they didn't attempt to solve the clearing house problem dealing with the small amount of fraudulent buyers or sellers who failed to deliver the goods or funds, as agreed. There are courts and people's reputations to solve bad service issues. The Wright brothers were the first to make a controlled, human flight, in a heavier-than-air powered machine at Kitty Hawk, NC. How was it possible that two bicycle mechanics were able to invent the airplane where others, before them such Langley and Chanute, had failed? The answer is straightforward, they simplified the problem. Langley and Chanute tried to solve two key aspects of aviation at once: flight and inherent stability. Inherent stability is a key feature of boats. As a boat rocks back and forth due to wind or waves, it inherently rights itself (so long as it's not flipped or flooded). The Wright brothers decided to forgo the inherent stability problem of flight and they took a simpler approach to solving the aviation challenge by borrowing from their experience as bicycle mechanics. A bicycle - the most efficient human powered machine - is inherently unstable. It cannot stand up, on its own two wheels, if you let it go. A bicycle's stability comes from two key principles: the rider continuously shifting balance and the bicycle's movement (centrifugal and gyroscopic forces created by the spinning wheels). Keep your center of gravity over the two wheels while moving and all is well. Whereas Langley and Chanute wanted inherent stability in their airplane's design, the Wright brothers solved for something simpler in their flying machine. The Wright brothers only wanted lift. They believed that stability would come from the pilot as he shifted his weight and manipulated control surfaces. In other words, the Wright brothers wanted absolute control and they made no concessions to built-in stability. The Wright brothers were able to solve the airplane challenge first because they solved a simpler problem basing their solution on a bicycle's principle of instability over that of a boats inherent stability. While simpler doesn't guarantee success in tech or business it's usually a good starting point. Have you ever stored a password for a website or e-mail account in your Mac's Keychain, only to completely forget it when you needed it later? I forgot that Keychain has a simple feature which will show you any password you've stored in it. This past New Year's Eve, I was at the childhood home of a high school friend where I was showing him, his mother, and girlfriend how to stream photos, music, and video to their Apple TV from their computers, iPhones, and iPads. When it came time for my friend's mother to enter the password for her iTunes account she had forgotten it. In the blink of an eye, she opened the Mac's Keychain app, which is in the Applications/Utilities folder. "Go Mrs. G!," I thought to myself. I suspect that she learned this trick from her brother who's worked at the Apple Store on Fifth Avenue. And a valuable trick it is. 1. Once you've opened Keychain, click on the username of the account that you used to login (jmoreno in the above screenshot). 2. Click on Passwords category, since it's a password that you want to recover. You'll have to find the MobileMe, iCloud, iTunes, etc account that you're looking for under the Name column (also, you can enter the account name, i.e. iTunes, Mail, etc, in the search box, in the upper right to narrow down the search). 3. Click on the Show Password checkbox. 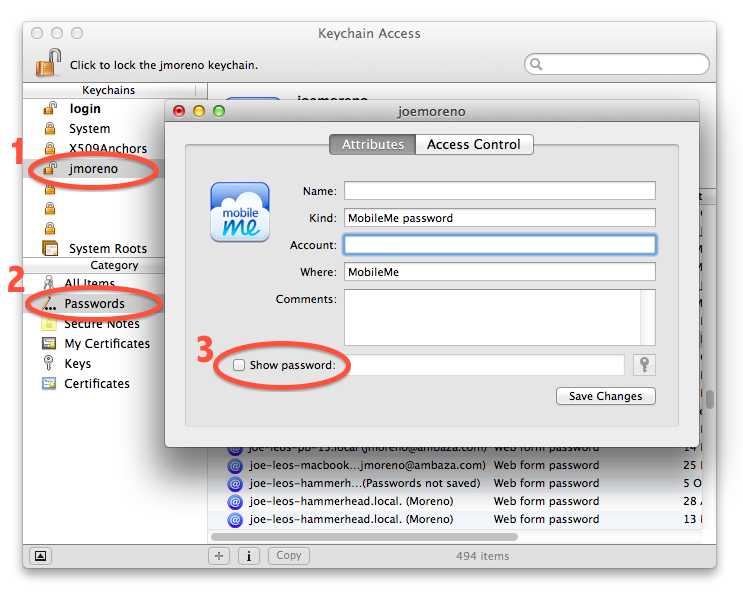 Keychain will ask you to enter your Mac's account password. The password that you're now entering is the one that you use when running a software update or after rebooting. 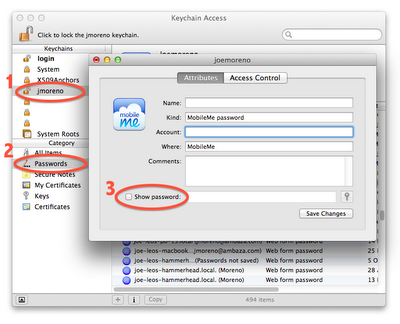 (You need to enter your Mac's account password since it's used to decrypt the password that you're looking for.) Once you've enter your computer's password the password will be displayed "in the clear." We used have an old Microsoft joke that we enjoyed telling when I worked at Apple. 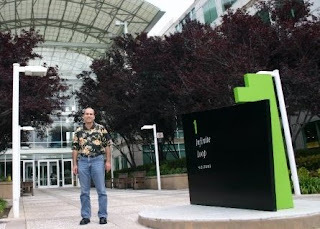 One day, some Apple engineers and Microsoft engineers ended up at the same train station on their way to a conference. After each Microsoft engineer bought a train ticket, they watched and wondered as the Apple engineers only bought a single ticket for their entire group. On the train ride, just before the train conductor came to punch tickets. The Microsoft engineers saw the entire group of Apple engineers pile into the lavatory. The Microsoft engineers watched as the train conductor knocked on the lavatory door and said, "Ticket, please." They were amazed when the lavatory door opened a crack with a hand holding out a single ticket which the train conductor punched, returned, and went on his way. On the train ride back from the conference, the Microsoft engineers, never wanting to let an opportunity to pass without copying Apple, bought one train ticket for their group. But, this time, they were puzzled when the Apple engineers boarded the train without purchasing a single train ticket. Just before the train conductor came to collect tickets, the Microsoft engineers all piled into the lavatory just as they'd seen their Apple counterparts do. At this point, one of the Apple engineers knocked on the lavatory door and said, "Ticket, please."